We were in Scotland the last week of May this year and had made an appointment with Iain to meet and have lunch in St. Andrews. He had agreed on doing an interview for WhiskyFun.com. Serge Valentin and I had prepared some questions and the result you can see here: www.whiskyfun.com. 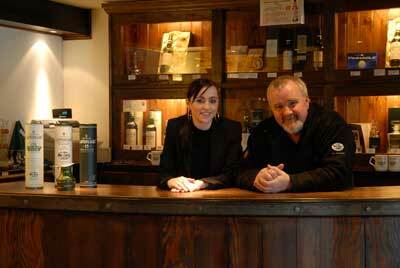 Thanks Iain for the interview and passing your love for the distillery on to me. The next months I will show some of Iains private pictures which he kindly has given me to scan. Ended my Face Book profile today. 18 year old "The Old Train Line"
New added: an experiment by my Italian friend Diego Sandrin, who finished a 10 year old cask strength distillery bottle in a Clinto cask for 14 months. I am not a big fan of exotic wood finishes but this is really good. Read Whiskyfun.com's comment about this bottle. 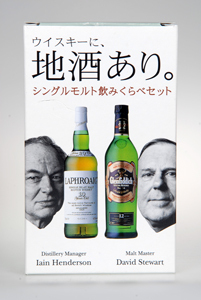 Through a marketing tie up ALLIED SUNTORY distributed both brands in Japan. 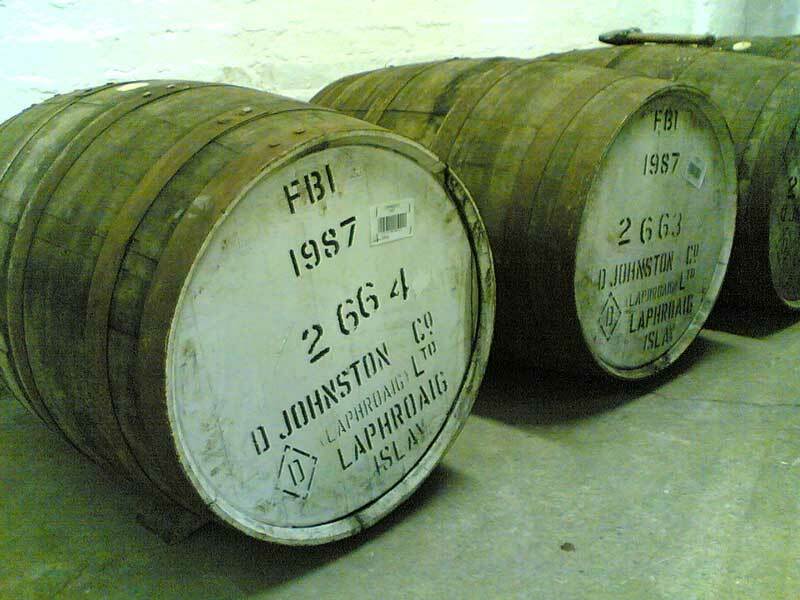 During the last year I have received several questions from the Johnston family and Gaelic researchers why Laphroaig's version on their website of the earliest history is different than the one in "The Legend of Laphroaig" and which is commonly accepted by historians. 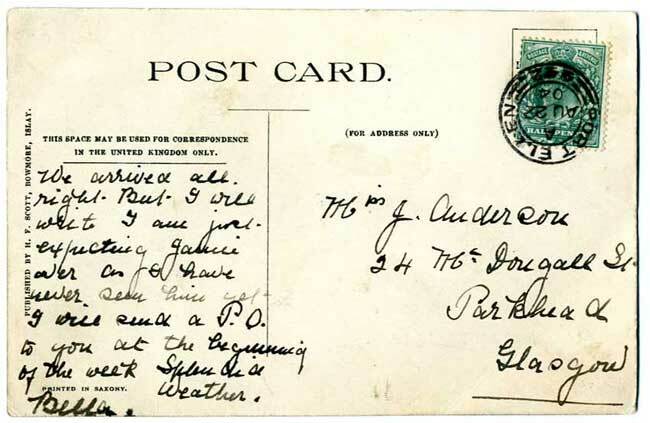 A lot of incorrect information has been written about their history in the past and this has always been a sensitive point to the Johnston family. Therefore I have added a small chapter to "history" about it. 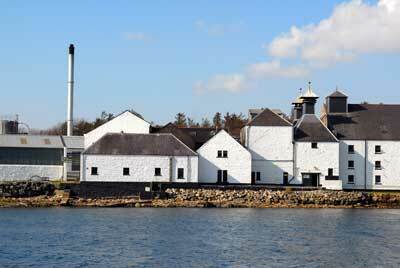 Come on Laphroaig, please change it! 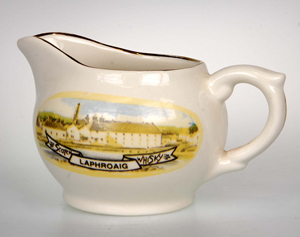 Laphroaig is not of Irish origin! The Christmas discount on "The Legend" has been ended today. Soon added: distillery bottle "Triple Wood"and the US version of the 21 year old. Link to a great new website by Philip Morrice. 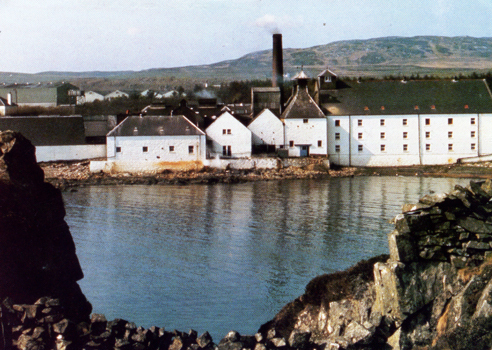 Philip published a book in 1987 called "The Distilleries of Scotland and Ireland". Familiar name? Right, a remake of Alfred Barnard's book from 1887 exactly 100 years later, both published by Harper's Weekly Gazette. 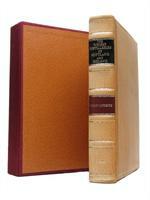 A 1000 copies were printed, originally for the trade only. An unknown number of books was destroyed during a fire of the warehouse the books were stored. 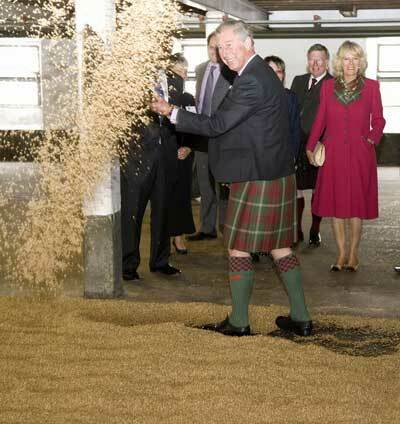 Like Barnard 100 years earlier, Philip visited every working distillery in 1985 and 1986. The result is one of the most beautiful whisky books I have ever seen, though not very well known. A masterpiece. Only a few copies are left. 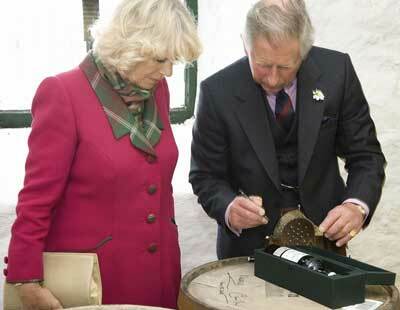 Philip is also the author of the Schweppes Guide to Scotch. This is what whisky and collecting make fun: a 10 year old US import probably from the 1940-ties or 50-ties. Extremely rare (thanks to Rafael Reyes, US). How rare can it get? Five year old cask sample that was given to Walter Schobert by former distillery manager Iain Henderson in the 1990-ties (many thanks to Werner Hertwig in Berlin, who knows a lot more about whisky than about football). 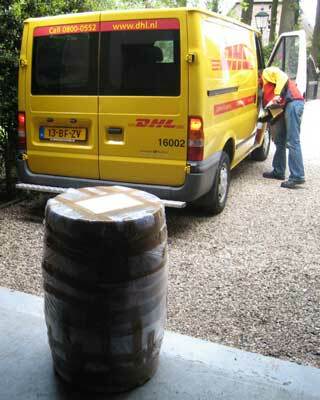 Quote by Han van Wees: "Today's whisky drinkers are having a hard time. 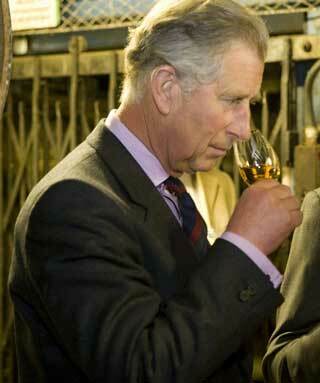 They have to make tasting notes, keep up with every new bottling, web site, whisky forum etc. Go to every festival and tasting. In the old days you just enjoyed your dram..."
Thanks to Chris Hayden (USA) I added this extremely rare US import 10 year old Laphroaig. An oldie probably from the 1950-ties or 1960-ties. Though I do not always agree with Serge Valentin on his ratings of whiskies (he is much too kind..), I fully agree with him that drinking and driving is bloody stupid. Whisky is expensive stuff and whisky drinkers are usually not poor people, so why not spend some euro's on a taxi or hotel? For your own safety and that of others. Therefore this banner and have a look on Serge's website. 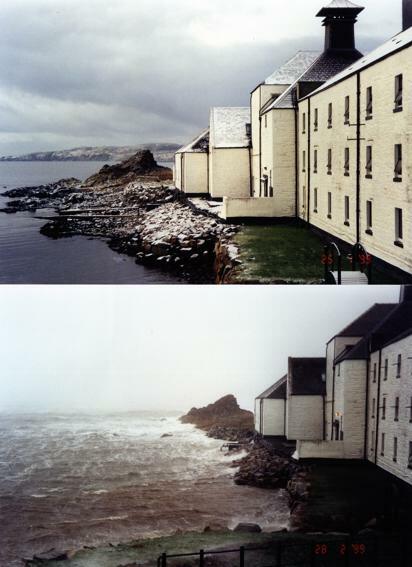 Received these pictures from Mark Unsworth from Islay Studios today. 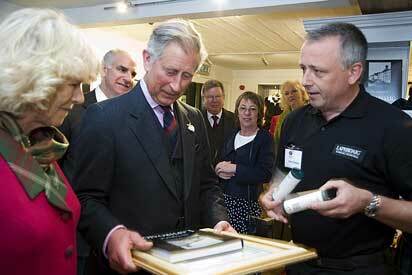 Mark has written a really nice book about Islay: "Islay Past and Present- A Century of Change". Thanks Mark. 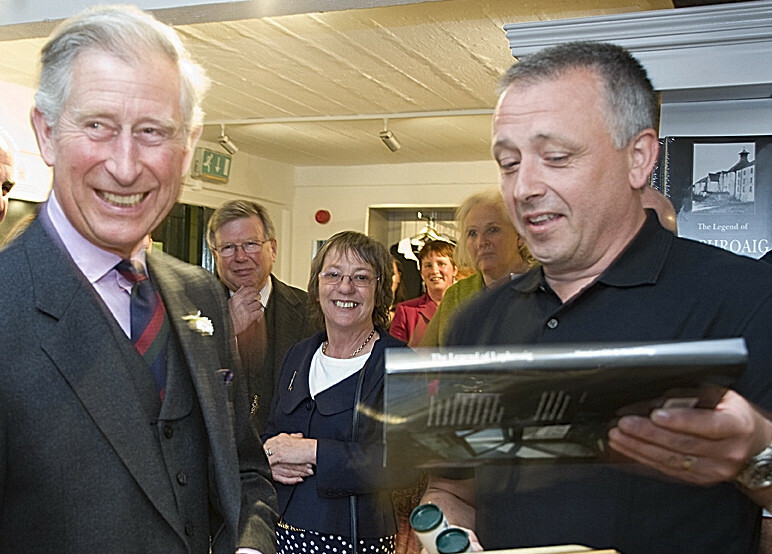 Here you see Alan Hyslop hand over a copy of our book "The Legend of Laphroaig" to HRH Prince Charles, which Hans Offringa and I had signed for him. Thanks Alan and Laphroaig. 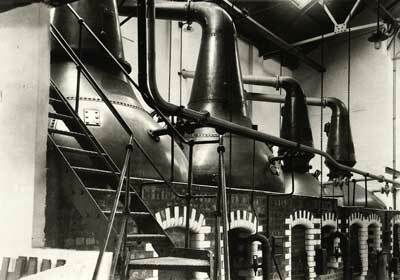 Really nice new website about the closed distillery Glenugie by Bob Hulsebosch from The Netherlands. Well done! Manager Evert Lans showing "The Legend" in front of a pallet of books ready to be shipped, just when I visited Dutch distributor Hexspoor. Page 3 added of "the distillery", containing 32 really nice pictures taken by Hans Offringa, during the making of "The Legend". 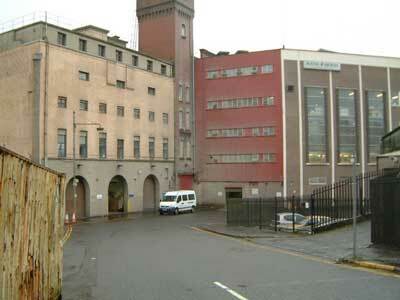 The left-overs of "The Legend": new added pictures of the distillery. Check the book for more pictures and explanation. New added: history section. A summary of "The Legend". 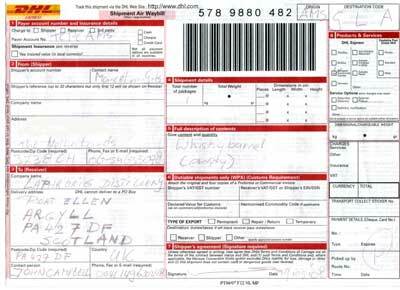 The 1978 cask returned to Islay and was picked up from my home on May the 19th. The cask will be displayed in the future museum. At last a new bottle! Never seen this one. Found it in Brasil! 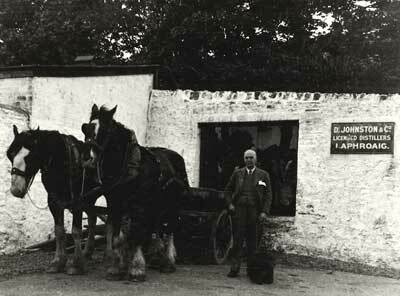 Rare 1o year very old distillery US import Elsbach & Co.
Two pictures of the launch of "The Legend of Laphroaig". Iain Henderson and Hans and Marcel. 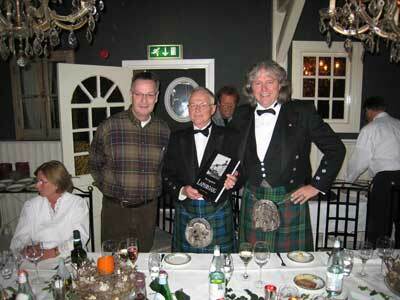 Master blender Robert Hicks with the authors. the release date is set for the 9th of November 2007, during the opening night of "Whisky Live!" in Leiden, The Netherlands. Here is the cover of "The Legend...". It's not completely finished but gives a good impression. At the moment we are working with graphic designer Gijs Dragt on the design of the cover and pages. Research, text and photography are ready and we are in the process of "fine-tuning". Hans Dillesse has made the illustrations, which we will place with every new chapter. 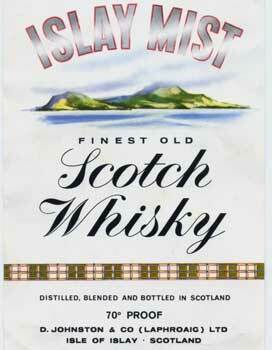 The book will contain some 210 pages, all about Laphroaig and nice old bottles, with lots and lots of pictures. 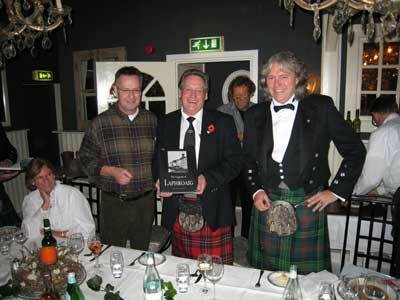 We are fine on scedule and planning to launch "The Legend of Laphroaig" during Whisky Live in Leiden, the Netherlands, on November the 10th. Hopefully I can show the cover in a week or so. My entire collection has been photographed by Dutch photographer Guus Pauka and we have discovered two new files. We have so much beautiful material now, it's gonna be difficult to make a selection. Hans Dillesse is working on the illustrations. I have seen a few, and they look just great. 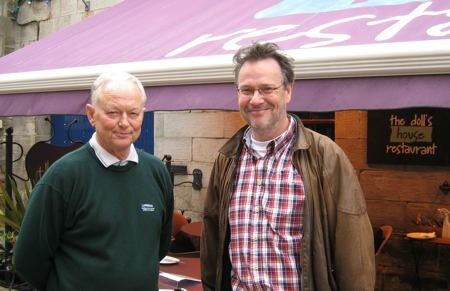 Together with Dutch whisky writer Hans Offringa and Laphroaig (Beam Global), I have started working on a book on Laphroaig, titled "The Legend of Laphroaig". 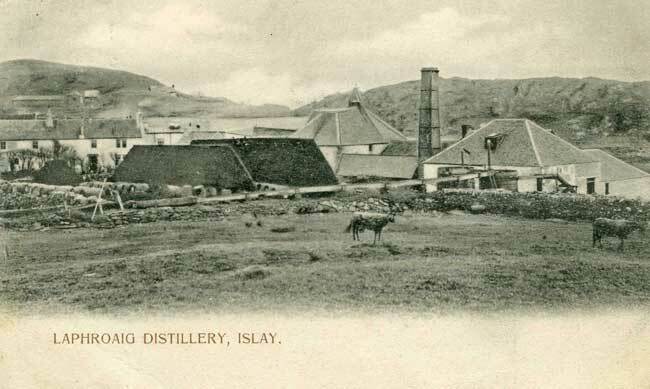 It will be about Islay, Laphroaig's history, Laphroaig today, introducing the people who make the whisky, and a big selection of Laphroaig bottles, containing almost every existing bottle. There will also be chapters about the Friends of Laphroaig, HRH Prince Charles and Laphroaig's website. Hans, his American wife Becky and I will go to Islay in April and make interviews, pictures etc. 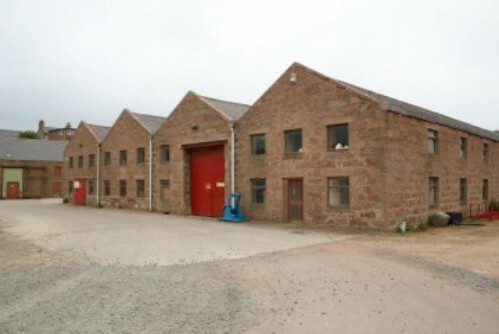 We have been kindly given permission by Michael Cockram of Beam Global to use any material in their archives available. I have seen most of it already and it is spectacular. Illustrations will be made by Dutch artist Hans Dillesse. 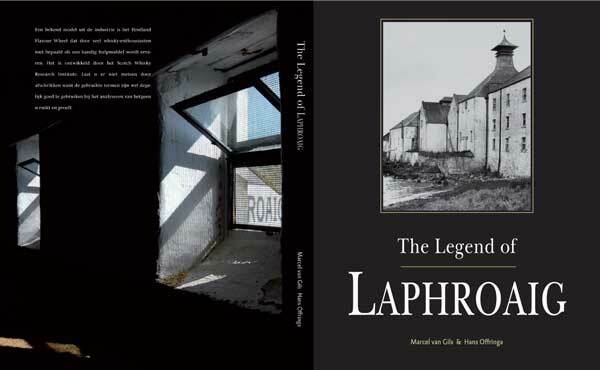 The book will be sold through the website of the Friends of Laphroaig and will be launched early November. 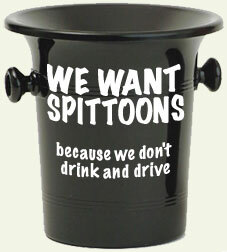 Anybody who has something which might be of interest to us, information, pictures, bottles, please, let us know!! Hard to find Japanese 10 year old "Pure Unblended Islay Scotch Malt Whisky"
label designed by webmaster Hans Dillesse !! 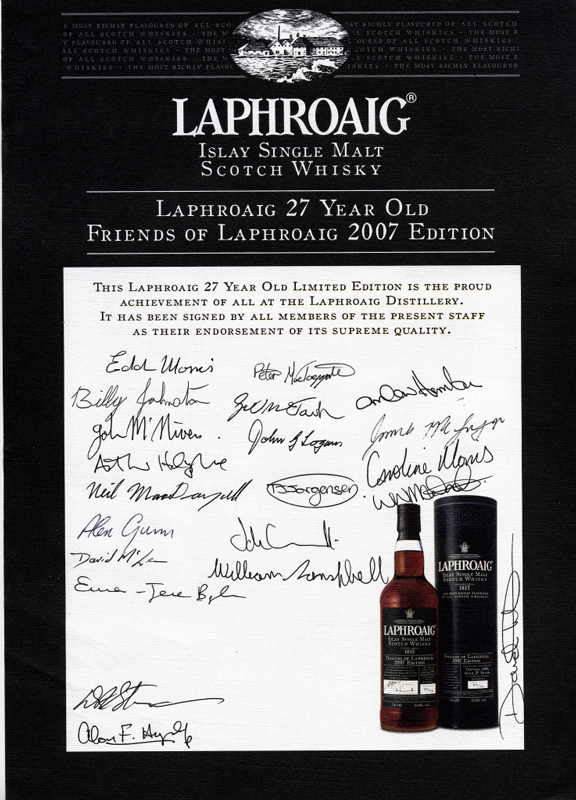 10 year old 20cl "Friends of Laphroaig"
If you are an Islay fan, have a look here! !